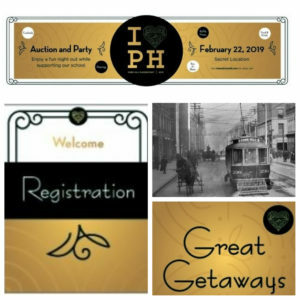 Party-goers dressed in 1920’s garb braved the elements on Friday, February 22 to attend the annual I Heart Park Hill Auction & Party hosted by Park Hill Elementary. SpeedPro Denver is proud to share that our studio donated 31 print pieces to visually convert the Montview Presbyterian Church into a speakeasy. 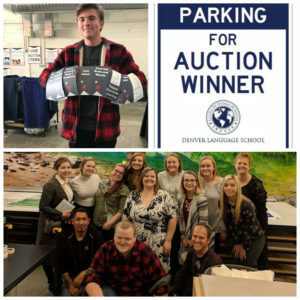 Graphics included a 15 foot long marquee banner, five by five foot banners, signage for the auction and silent auction as well as sponsor, registration, photo booth, and student project posters, among others. This is the third year we’ve supported the school’s events with in-kind print donations. We also sponsor the Denver Language School and McAuliffe Middle School, both right here in our Park Hill neighborhood. Congratulations to the event team on exceeding their ambitious fundraising goal! We’re taking a moment on Colorado Gives Day, December 4, to share how our thriving studio is giving back to the planet, the neighborhood and the art community. The Planet: Over six months we recycled 2,278 pounds of materials; about a third of all our “waste” as measured by Alpine Waste & Recycling. That translates into 16 trees saved, 5,183 gallons of water saved and we avoided expelling the carbon equivalent of 3,114 pounds of emissions into our atmosphere. The Neighborhood: Again this academic year we are sponsoring three Park Hill schools with in-kind donations of large format printing. Denver Language School, Park Hill Elementary and McAuliffe Middle School have ordered free graphics for fundraising events, outdoor banners and indoor signage. The (Aspiring) Art Community: Early November we hosted about a dozen design students from Minnesota’s Bemidji State University who were on an excursion to meet with trade show companies and large format printers. Our owner and production manager gave the eager students a detailed tour and answered dozens of questions about getting designs out of the software and off the screen onto sides of buildings, into trade show booths, onto gym walls and floors, and wrapped onto 40 foot long buses. 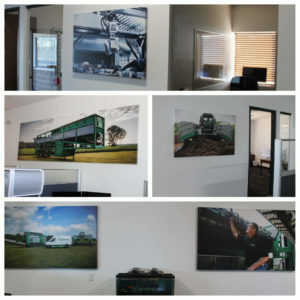 Komptech Americas, proud manufacturers of machines built for shredding and separating biomass and solid waste with colorful names like Crambo, Hurrikan and Terminator, came to SpeedPro Denver to print 11 over-sized canvas prints for its Denver office. Prints as large as 13 feet wide and 4 feet tall were installed. We were the natural choice since over the past few years we printed trailer wraps, trade show graphics, floor graphics, and fleet decals for the growing business. They are so committed to their branding we also printed a graphic for their lobby aquarium! SpeedPro Denver has been printing and installing all kinds of graphics for Regis over the past few years. You see our work outside in the aluminum reserved parking and permits signs and in the decals on the Campus Safety vehicles. 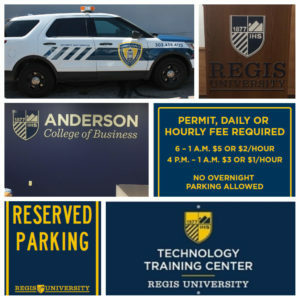 Moving indoors, we have provided acrylic signs for the Technology Training Center, branded podium signs, banners for registration desks, and a wall mural for the Anderson College of Business. We enjoy working with this prestigious institution and our pride shows in our quality work. What an engaging, powerful message from the Denver Rescue Mission! 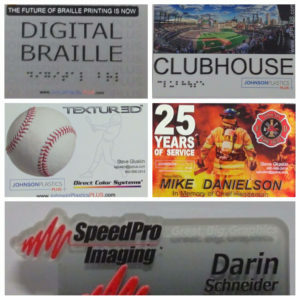 SpeedPro Denver is proud to be its long-time large format print partner. 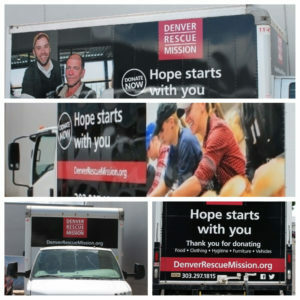 Most recently, we removed and placed new graphics on nine box trucks and two vans. Our highly trained, experienced wrappers hand-installed all that vinyl in less than two weeks. 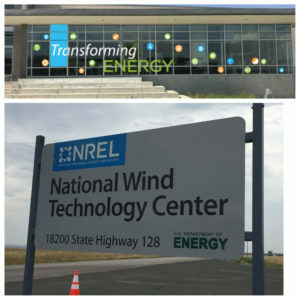 SpeedPro Denver handled numerous jobs for the National Renewable Energy Laboratory over the past few months. Anticipating a VIP (whom they would not name but turned out to be US Energy Secretary Rick Perry who toured the Lab on August 14), the campus went in over-drive to freshen up its main 8’ x 4’ entry signage, added a series of fun window graphics to its cafeteria, hung 20 custom double-sided Transforming Energy-themed pole banners, had decals printed and placed to cover vans’ sides, back doors and hoods, and even had us wrap a wind tunnel! Our studio is thrilled to work with this Golden-based world-renowned research facility. Happy Anniversary to Us! We are 7 and Thriving! 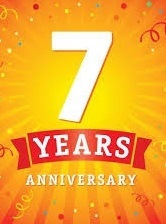 We celebrated our seven year corporate anniversary on August 6 and it’s all thanks to our wonderful clients. Over the past year, we have made even more equipment investments and expanded staff to make sure we keep up and hopefully exceed the high level of service our clients have come to rely on. Clients range from large telecomm fleets to trade show planners, marketing departments, food truck companies, other printers, healthcare, and schools. Send your congratulations to Owner Darin Schneider and the staff by following us on LinkedIn and friending us on Facebook. ADA-Compliant Signs Roll Off Our Shiny New Printer! Need a simple sign to comply with the new Colorado rule mandating non-gendered signage for single-stall and family bathrooms? We can do it! ADA compliance is now a breeze. Our 3 Dimensional printer has been pre-programmed to translate copy into Braille. We now produce letters, numbers and graphics from 12 inches wide by 24 high and up to 1-1/2 inches thick/deep. Dimensional wall plaques, textured interior and exterior signage, commemorative keepsakes that can stand-alone or hang, name badges that can replace those pricey company shirts—we can do all that and more! We offer 44 standard paint colors including gold, silver and bronze metallic and graphite. Substrates include acrylic, Glotech, mica, metal laminates, and PVC. Give us a call at 303.426.4199 or email denver@speedprodenver.com to talk about your job and request a sample. Mile High Custom Food Trucks builds out step vans and trucks–lots of trucks. Then, SpeedPro Denver makes them memorable by printing and installing custom wraps and sometimes we get the fun task of designing too! That was the case for our most recent wrap job for Dos Gringos; two white guys who love fusing Mexican and American dishes so much they cook it nearly every day. At 26 feet long, the 12 hour installation went well and was delivered on schedule and the moving billboard will last anywhere from 5-10 years. You’ve probably seen some of our other stellar work roving around town including trucks for Island Vibes Jamaican food, Karma Indian fare, and Farmer Joe’s selling sandwiches, salads and soups. We wrap year-round so call us anytime for a free consultation. Rattlesnake & Reindeer Dogs?! 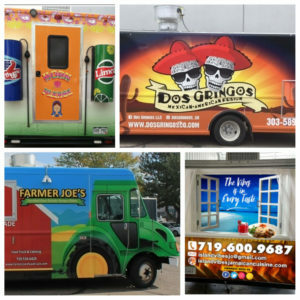 SpeedPro-Wrapped Downtown Food Carts Hard to Miss! 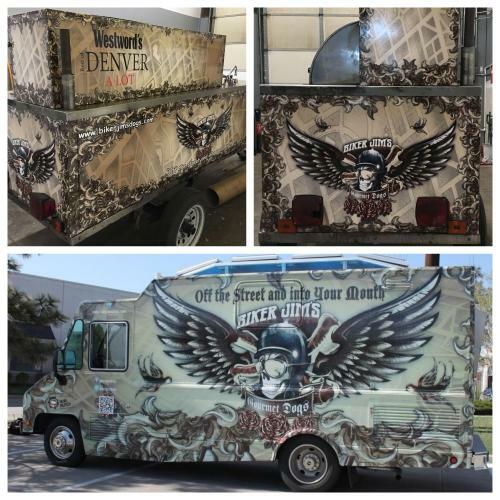 For many years the Denver studio has wrapped distinctive food trucks and carts for Biker Jim’s Gourmet Dogs and we just finished a cool new cart to kick off the outdoor season! The multi-level cart is eight feet long and the food truck 30 feet. We also print retail signage, table throws, menus on magnetic materials that can take the Colorado sun, hundreds of branded stickers, and special menus for carts rolling into Coors Field. Wild Horses Can’t Keep CDOT Away from SpeedPro! The Denver studio just wrapped six new Bustangs! 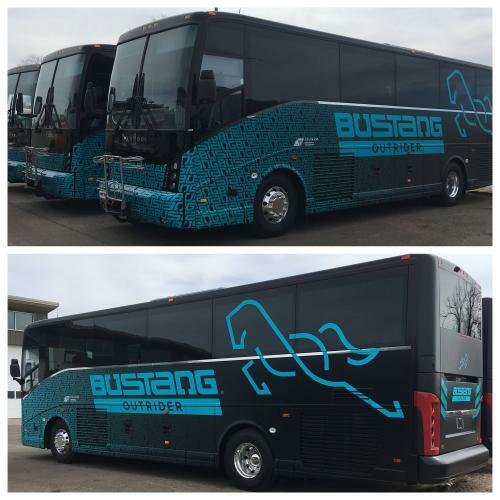 You won’t miss these beautiful blue and black moving billboards on the highways; the routes from Denver takes riders north, south and west—in wild west style being pulled by horses! An expansion of the popular line of purple buses, CDOT is partnering with Greyhound to offer more routes to even more riders. Sadly, Adams County Deputy Gumm was killed in the line of duty on January 24, 2018. Just 32, Gumm had served in law enforcement for five years. 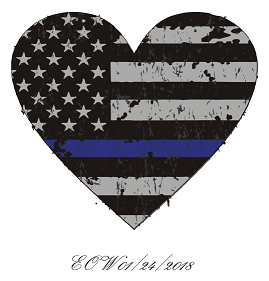 SpeedPro Denver was honored to be chosen to print 400 End of Watch 6″ x 6″ vinyl stickers for the County to use on police cars honoring Heath and his service to his community. SpeedPro Denver has just completed the installation of an impressive 144 window job for Larry H. Miller in Lakewood! The five vehicle photo array showcases Ford’s top sellers including the F150, Fusion and Explorer. Each roughly 4’x 4’ window was covered with perforated window film with optically clear laminate to deliver maximum impact and hold up in Colorado’s frequently changing climate. Up to 30 individual pieces of film collectively present a nearly 20 foot high photo of each vehicle creating impressive, inviting images. 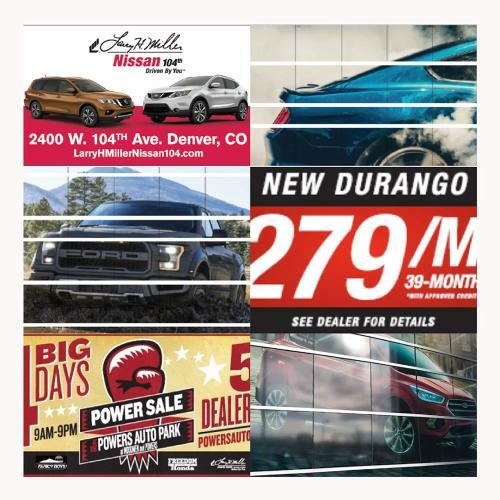 Saxton Horne, the exclusive marketing agency for Larry H. Miller, has commissioned us to print indoor and outdoor banners pushing weekend specials, sales floor desk wraps, and fleet vehicle magnets for branding and limited time deals. We were thrilled to work with them again and look forward to doing more projects like this one. Drive by the dealership on 6th near Union and be prepared to be blown away! Over the past four years, we’ve been pleased to work with DNM Events providing custom graphic touches to support their clients’ Zombie Conventions, Halloween and holiday corporate parties, high-end weddings, oil and gas gala’s, and many, many other engaging, themed happenings. We’ve produced foamcore surfboards, seven foot high film reels, carnival banners, nostalgic posters, fundraising rock-star-themed signage, over-sized logos, and custom cutouts in just about every shape and size possible to support their over-the-top events.